Happy Fourth of July weekend, everybody! We’ve got a bunch of good comics this week, and I’ve got a day off from work on Tuesday, so I’m in all manner of good spirits. We’ve got some quality Spider-Man and Batman comics this week, which is always a hoot. 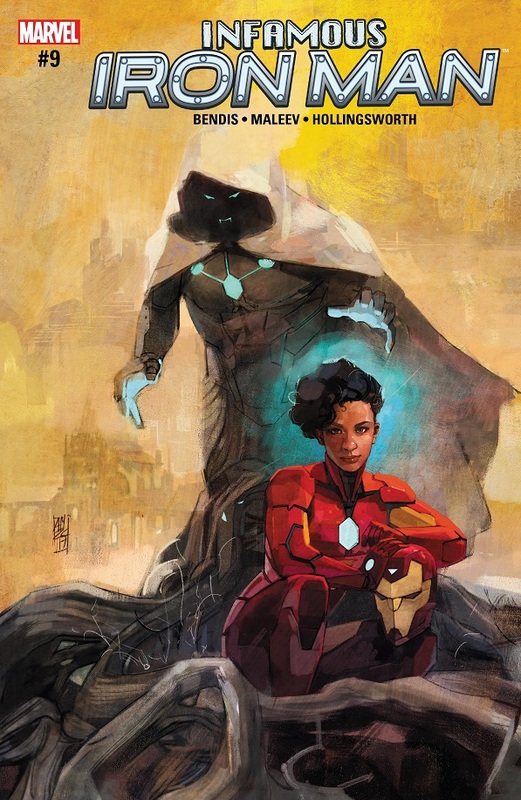 And Comic Book of the Week goes to another stellar Infamous Iron Man. I’m just loving that comic! Most I’ve liked Ben Grimm in years! I skipped a double dose of Young Jean Grey this week. Her solo series was just a team-up with Prince Namor, who I don’t care for. And X-Men Blue was pretty interesting, but I swear to God, if Cullen Bunn brought Jimmy Hudson into that book just to revive the Cyclops/Jean Grey/Wolverine love triangle then I am done with that comic. Full stop. Comic Reviews: Amazing Spider-Man #29, Batgirl #12, Defenders #2, Detective Comics #959, and Infamous Iron Man #9. This issue kicks off a Secret Empire tie-in, so I don’t know how stringently I’ll review the following issues, but this one in particular was fun. When Secret Empire struck, Peter Parker was in the middle of a TV interview trying to make amends for what his company did during the invasion of Symkaria. When all the HYDRA stuff happens, Spidey heads out into the city and finds his company overrun with goons. They get into a fight, but their boss calls them off. Peter goes up to meet him and it’s the Superior Octopus! He wants Peter to hand the company back over to him, since Otto is the one who started it, after all. Peter refuses and Otto flips a switch that makes it look like Parker Industries is responsible for the Dark Force bubble that covers Manhattan. Peter rushes off to help the other Avengers in Washington DC, and Otto blows up the Parker Industries building. Heh, the issue starts with a great scene of Anna Maria trying to coach Peter through his TV interview. She knows he’s Spider-Man, and she knows that he’s going to want to leap into the fray immediately once all the trouble starts, but from the sidelines, she keeps throwing him nasty looks and hand gestures to get him to stay put. It’s awesome and a solid reminder why Anna Maria is the best new Spider-Man character to come along in forever. No running off to play superhero in the middle of an important TV interview! And you can’t have Anna Maria without checking in on Doc Ock, and I liked this issue for the first confrontation between Peter and the Superior Octopus. 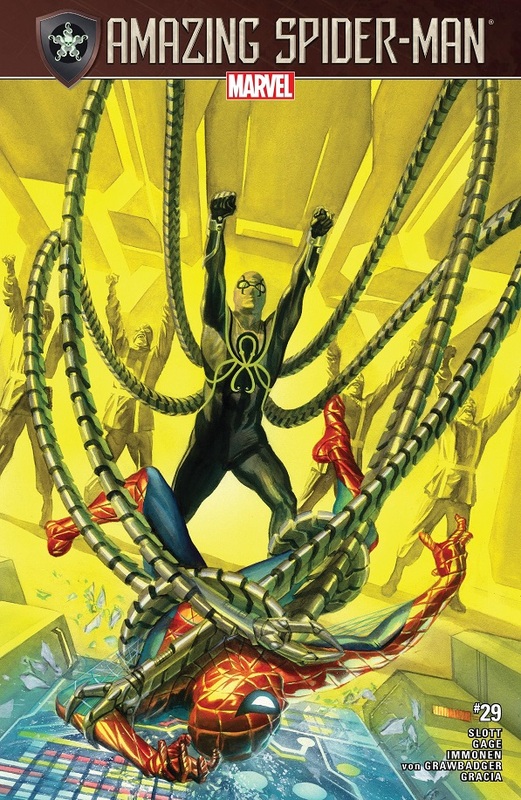 I have pretty much loved everything Slott has done with Doc Ock, especially since Superior Spider-Man, so I loved this. I like how Peter tried to reason with Doc Ock to get his help in stopping the Dark Force invasion. I like the Superior Octopus’ costume. I like the idea that Otto just wants control of his damn company back, that in the end, Peter didn’t really build any of Parker Industries. So it’s a solid showdown between the two before Peter rushes off to join Secret Empire. I haven’t been that big into Parker Industries since Superior Spider-Man ended, so I won’t be as sad as I was back then to see it go. 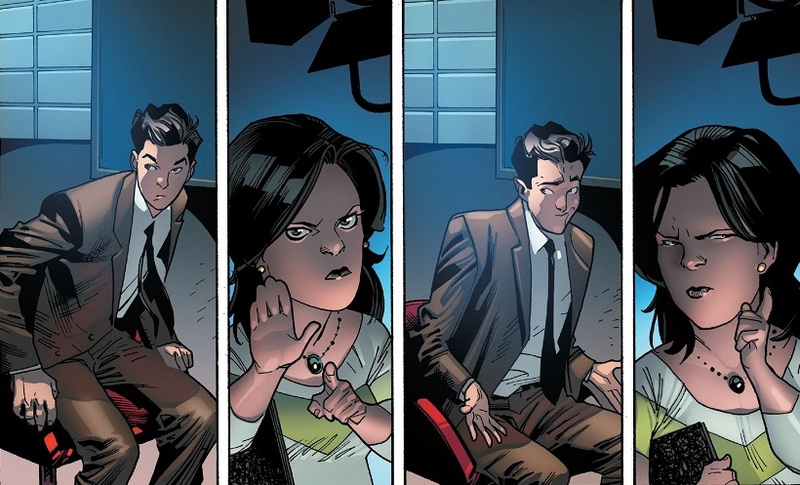 But Peter interacting with both Anna Maria and Doc Ock is always fun. TL;DR: A Secret Empire tie-in kicks off with a nice showdown between Spider-Man and the newest version of Doc Ock, so at least this issue has that going for it. I hope the rest of the tie-in is this good. I took a break from reviewing Batgirl for awhile and ended up missing a pretty neat story about the Penguin’s son. Well now I’m back! And this stand alone issue is a bit…weird. So there’s a ghost/spirit haunting a pool at the Burnside YMCA, and Batgirl goes after hours to investigate. Except, for some reason, her investigation is public? And she goes on the same night as a chatty Youtube ghosthunter named Kayla P? Like, Batgirl tries to be all scientific in her work, but she has to put up with this annoying girl and all the cameras she brought along. It’s weird. Why not just investigate quietly on your own? Batgirl takes a sample of the pool water to get tested. Rather than use the Batcave to test a bit of water, Batgirl takes it to her friend Qadir. But he’s an engineer and has no idea how to test water, so he recommends a chemistry student, who he also has a crush on. The student tests the water and determines that it’s perfectly normal pool water. Qadir and the chemist suggest Batgirl ask world-renowned physicist Radden. Try to follow the logic on this next part. Batgirl Googles Radden to learn more about him and discovers that he’s famous for inventing a type of teleportation, and also that his lab assistant, Liana Soto, went missing (there was also a missing person’s flyer posted at the YMCA). Batgirl immediately makes a leap in logic that the ghost in the pool must be this missing girl? She solidifies her theory when she checks out the girl’s apartment and discovers that she was the one who invented the teleportation, not Radden. So Batgirl thinks that, since the ghost appears when the pool is full of people, if she fills it up with people again the ghost will reappear and Liana will be able to re-materialize. She gathers a bunch of people in the pool — including Kayla P for some reason — and sure enough, the ghost appears, but it starts attacking people. Kayla P suggests the ghost is blind, and therefore just lashing out, so Batgirl takes her camera and throws it into the water so that the ‘ghost’ can use it to see. That works and Liana reforms, while also absorbing the camera? Babs gets Liana a job at her energy company and Frankie mentions that the girl has a camera in her head now? Oh, and yeah, Radden shoved her into the teleportation pod to get rid of her so that he could steal her work. So he gets arrested. Look, this was a perfectly fine story about Batgirl solving a missing person’s case using weird science and logic. The art is good — including Batgirl’s official swimsuit costume for when they all get into the pool — and the writing is fine. This is a perfectly good Batgirl comic. But man, does this story involve one giant leap in logic after another. 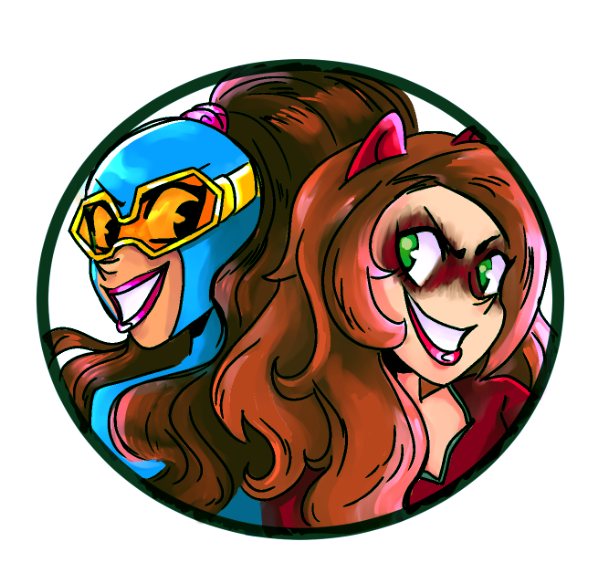 Rather than investigate the pool quietly, Batgirl for some reason teams up with a loud and annoying Youtube personality? 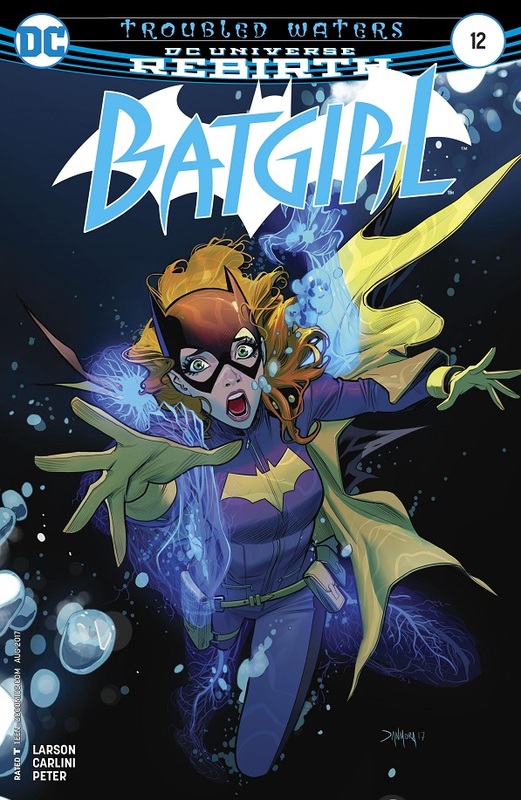 Rather than use Bat-resources to test a simple vial of water, Batgirl has to go on some roundabout trip that eventually settles on just trusting some random chemistry student she doesn’t know? Radden’s name comes up randomly from her friend, and yet somehow he’s responsible for the ‘ghost’ in the pool? How does Batgirl even jump to the conclusion that the missing lab assistant she read about online is the ghost in the pool? It’s a bit of a stretch. Then when Batgirl needs to fill the pool with people, why call on Kayla P? Wasn’t she annoying and dumb? Why get her involved again? TL;DR: This was a perfectly fine issue of Batgirl, but there are so many leaps in logic and really stretching plot points that I kind of think Hope Larson just scribbled something out with her deadline approaching. I hope The Defenders TV show is better than The Defenders comic based on it. Not that this is a bad series, it’s just a wholly manufactured, by-the-numbers series. Luke Cage is being treated by the Night Nurse after his run-in with Diamondback, and with a little assist from Blade, the Night Nurse is able to save Luke from Diamondback’s poison. The other Defenders then reach out to the likes of Wilson Fisk and Ben Urich to find Diamondback, and they do, though they don’t seem to coordinate their attack. Jessica attacks first ’cause she’s mad. Then Daredevil shows up to help out. Then Iron Fist shows up to help out. Diamondback gets away and then the three of them are all shot by the Punisher. Did you know that Punisher also has a Netflix show coming out soon? Also, did you know that Blade is going to show up in the action figure line for the Netflix Defenders? Because I’m pretty sure the action figure Blade is identical to the cameo Blade in this issue. Now, I don’t want to suggest that this comic is so corporately-restricted that it synergizes with an action figure line, but it would make total sense. Don’t just give away your secret identity to the Kingpin, doofus! This is the sort of comic that Brian Michael Bendis could do in his sleep. He knows these characters like the back of his hand, and he knows he just needs to write a harmless, reader-friendly comic that is identical to the upcoming TV show. And that’s exactly what this is. Hell, I’m surprised they’re using the Linda Carter version of Night Nurse and not simply taking Luke to see Claire Temple. She’s already been re-introduced into Marvel Comics in the pages of that Captain America: Sam Wilson comic, so she’s definitely free to appear in The Defenders comic. I have to imagine she will eventually. Why else does this comic exist? Though I would also accept it existing to showcase Marquez’s awe-inspiring art. 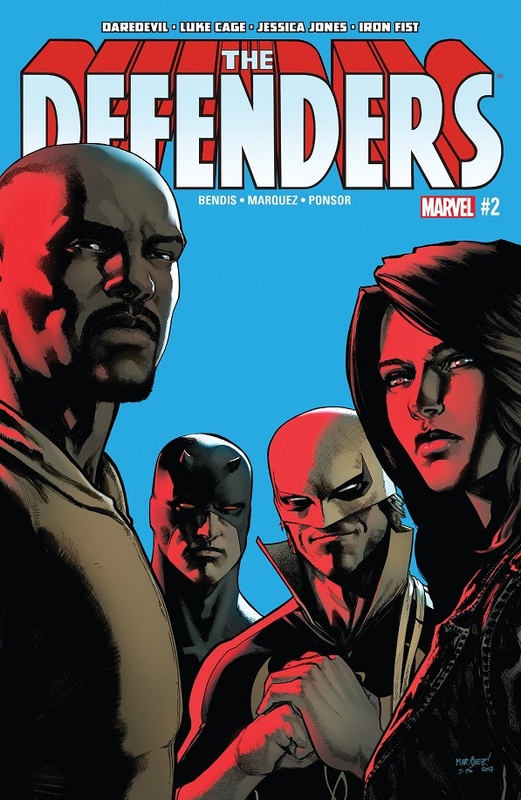 TL;DR: The Defenders may be the most corporately-mandated comic I have ever read. This is the sort of fluff comic that Brian Michael Bendis could write in his sleep. It might as well say “Officially licensed from Netflix” on the cover. 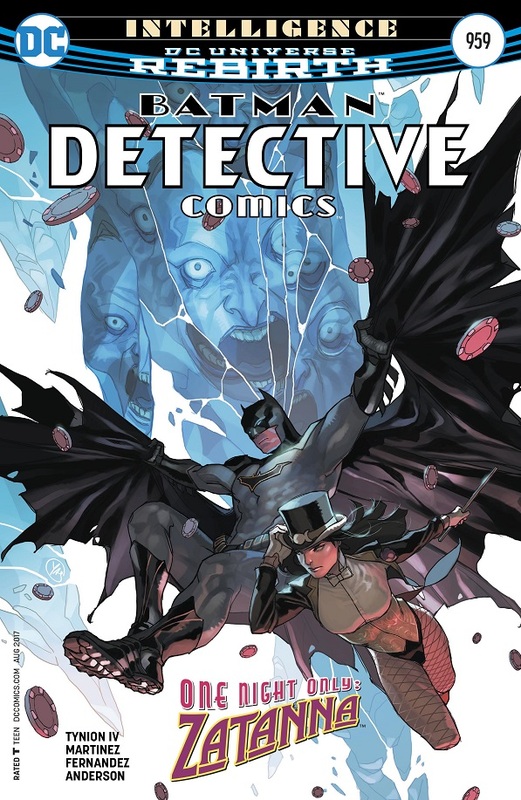 Who doesn’t love a good Batman and Zatanna team up? Batman and Zatanna team up with the other Bat-heroes to defeat the evil robot, but when it touches Azrael, both he and the robot suffer some strange vision. The robot gets away and Azrael goes off to be alone. Dr. October is invited to the Belfry to examine and flirt with Nomoz, while also possibly offering Clayface some medical care. Batwing and Batwoman head to Foxtech to look into the robot’s internal programming (also, Batwing has Gordon’s robot batsuit in his lab). And Batman and Zatanna discuss some old magical favor Zee once offered that might now help Batman prevent any further deaths like Tim’s. Meanwhile, Azrael’s psyche comes face-to-face with a big, dark, scary angel demon thing. I have always liked the relationship between Batman and Zatanna. I liked her one-off episode of Batman: The Animated Series, and DC has since done a good job of establishing them as lifelong friends with just a touch of romantic tension. Tynion continues that tradition with this issue, and I loved it. So that was a really solid part of the issue. The rest is fun too. I like Dr. October flirting with Nomoz. I like everybody pairing off to investigate different parts of the case. I like the idea of digging deeper into Azrael. Detective Comics remains an excellent Bat-family comic with a truly fun and exciting cast of characters. And I can’t wait for Tim Drake’s big return! TL;DR: The same Bat-goodness at the same Bat-time and in the same Bat-comic. Anyone still sore that there isn’t a Fantastic Four comic right now should be reading Infamous Iron Man. Forget Johnny Storm with the Inhumans or Ben Grimm shoved into the Guardians of the Galaxy, this is where you’re going to get quality F4 follow-up! Victor Von Doom has a vision with the older Sorcerer Supreme Tony Stark, who warns Victor that he has to stop being Iron Man because the Iufearu are coming for him. The vision is interrupted and Victor passes out, so Riri Williams takes him into custody and turns him over to SHIELD. Meanwhile, after his suspicious meeting with the Maker in the previous issue, Ben Grimm meets with Johnny Storm in a nice little dive diner. The old friends catch up, crack a little wise, and commiserate on what’s become of Reed, Sue and the Fantastic Four. It’s a touching and sad scene and I loved it. They confirm that whoever visited Ben probably wasn’t the real Reed Richards. Afterwards, Ben gets called to the SHIELD helicarrier because Doom is on board. While on the way to the holding cell, a couple SHIELD cadets force their way into the cell, intent on assassinating Dr. Doom. But Doom’s mother shows up, forces them to kill each other and then tips the entire helicarrier into the freakin’ ocean! When Doom wakes up, he’s in his mother’s room and she tells him it’s time to discover the true Von Doom legacy. This issue featured another gloriously simple and calm conversation that kept me on the edge of my seat. I like realism in my superhero comics. That’s probably my No. 1 favorite trope in the funny books. So no, I didn’t read about the Thing joining the Guardians of the Galaxy. Or the Human Torch shacking up with Medusa and the Inhumans. But you damn well better believe I love a solidly written, expertly drawn, quiet little scene where the two old friends get together and bust each other’s chops about those respective stupid adventures. And I love it even more so when they address the elephant in the room, when they try to discuss whatever happened to Reed and Sue Richards. This is why I love big, status quo changing stories. Everybody needs to stop whining that Jane Foster is Thor or that Marvel doesn’t have a Fantastic Four comic. It’s because of stories like Infamous Iron Man that we get to see these characters as real people. Life is messy. People die or they disappear at the end of a massive, reality-warping event. And in life, the rest of us have to keep living our lives without those people. Ben and Johnny will go their separate ways and have wacky adventures with other Marvel teams, but deep down, they’re still family, even if they don’t see a lot of each other. And Victor Von Doom will be so touched by what happened that he tries to turn over a new leaf. These stories are only temporary. The regular status quo will return at some point. But until then, I am going to enjoy the hell out of these new and unique character situations. Especially when they’re this well-written and this steeped in classic continuity. 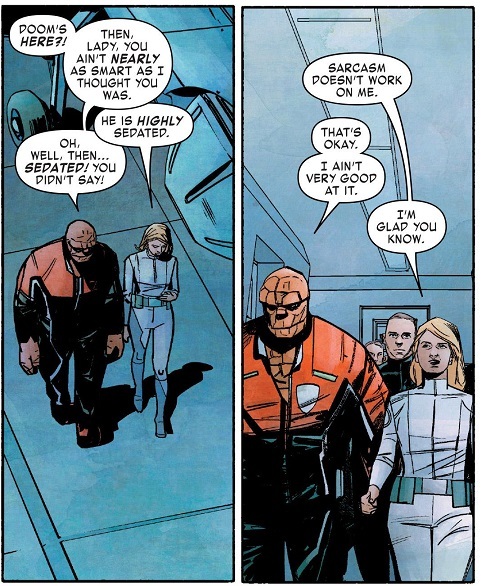 I am far, far more interested in watching Victor, Ben and Johnny try to pick up the pieces of their lives than I am in whatever random, wacky adventures a reunited Fantastic Four would be going on. Victor is mostly out of it this issue, so he doesn’t get any good drama. The tease from Future Vision Tony Stark means nothing at the moment, nor am I particularly curious about whatever mystery his mother wants to show him. But I rather liked the bit of character work on a couple random SHIELD agents who want to take it upon themselves to assassinate Doctor Doom when they have the chance. That was a neat touch that helped enliven an otherwise standard scene. And Maleev’s drawing of the SHIELD helicarrier tipping into the ocean was pretty gorram sweet! TL;DR: Infamous Iron Man affirms its place as the classic Marvel comic that everybody should be reading. This comic just feels important, and is all around quality to boot. Posted on July 1, 2017, in Batman, Comics, DC, Marvel, Reviews, Spider-Man and tagged Amazing Spider-Man, Batgirl, Defenders, Detective Comics, Doctor Doom, Infamous Iron Man, The Defenders. Bookmark the permalink. 1 Comment. Amazing Spider-Man is OK. It’s more Slott Spider-Man. Meh. Defenders was pretty good. It’s Bendis doing what he does best. Infamous Iron Man is good. It’s got some fun stuff. Ben and Johnny reuniting was nice. Jean Grey needed more Namor abs. His condescension is always entertaining, though. As for X-Men Blue, oh look, another subplot. Because if there’s one thing this book needed, it was for yet another sub-plot. And yeah, I really don’t want Bunn doing a Jean/Jimmy ship. Nope. So much nope for that.